In Teams, I’ve created a new team called “SP Blog Example”. Here, I’ve uploaded a couple of files. The first one is our “Data file – PowerPivot example.xlsx” file, which contains our usual cut-down version of the AdventureWorks dataset. 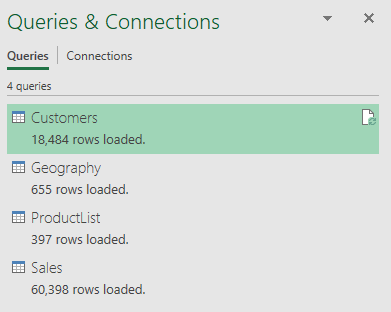 The second file is a new one that I’ve created called “Excel to Power BI.xlsx”. This file is very simple – it’s just a blank Excel file that has four queries inside, connecting to the AdventureWorks dataset. Then, I’ve saved the new file into the SharePoint folder relating to the SP Blog Example team, in the General channel, which is why you see it in the first screenshot. Now, what we’re going to do is publish this file to Power BI. This is a bit different from creating a PBIX file and publishing that instead. 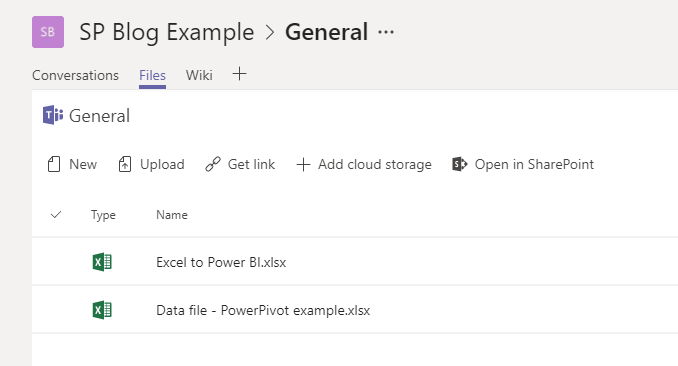 Within Excel, in the File tab, there is a Publish button, giving you options to either Upload or Export your workbook to Power BI. 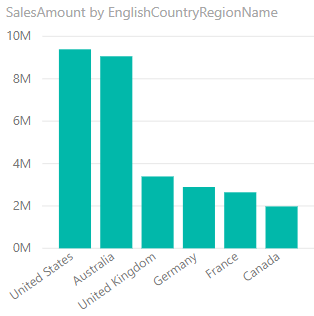 We want to Export it, so that we can create Power BI reports from the Data Model that was created using the four aforementioned queries. Now, I can use this dataset to build a report. 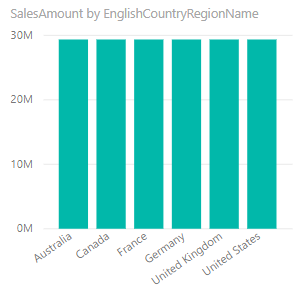 After clicking on the first action, Create Report, I can build a simple visualisation, plotting sales against the geographical country. Whoops – what have I done? It appears that I haven’t set up relationships in my Excel file. Ok, no harm done, we can go back to Excel and set up the relationships we need in Power Pivot, and save the file. To update Power BI, we now have to… simply sit back and wait for Power BI to update. Because the file is saved on SharePoint and published to Power BI from there, Power BI will regularly check back to the file every hour or two and process any updates to the file. It won’t run a refresh of the Data Model and the queries used, but it will pick up any changes to the file, such as new relationships or calculated columns and measures, and any new tables that might have been created. Come back next week to see how we can publish our reports back to Teams!